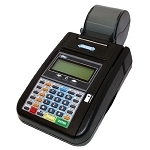 The compact Verifone VX 510LE quickly processes card payments. 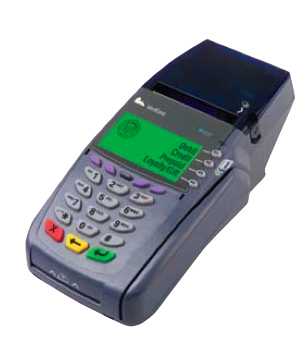 Designed with an instantly intuitive ATM-style interface, large backlit display, ergonomic keys and bold menu prompts, the VX 510le makes usage a breeze. 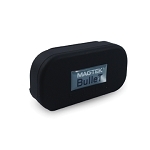 And its compact size helps keep your countertop clutter free. 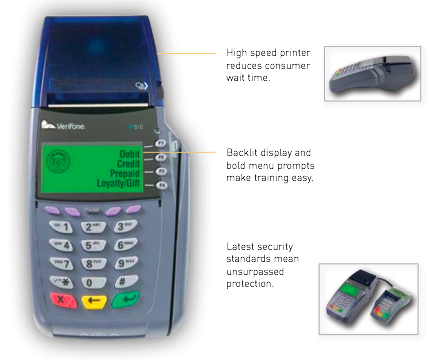 Complete with multi-merchant capabilities and a built-in PCI PED approved PIN pad, the VX 510le is a small merchants most productive tool. 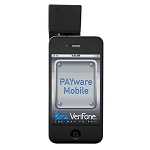 Want to rent the Verifone Omni VX510LE? Only $19.95* per month. 1.5, 3 or 4 MBytes. 128 x 64 pixel LCD with backlighting; supports 8 lines x 21 characters, including graphics. Triple track (tracks 1, 2, 3), high coercivity, bi-directional. Two RS-232 ports and 1 telecom port support peripherals. 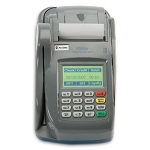 Integrated thermal printer with graphics capabilities, 12.5 lps, 24/32/42 columns; standard roll paper 58 mm (2.25 in.) x 25M. Bell 103/212a; ITU V.21/V.22/V.22bis/V.32/V.32bis ? 300/1200/2400/9600/14.4 kbps; V.42 LAPM error correction. DSS1 (Euro-ISDN) or 1TR6 (German National ISDN) ITU? V.110/V.120 in B channel; X.75, PPP, or HDLC in B channel; X.25 in B or D channels; X.31 in D or B channels (9600/64000 bps); ML-PPP (PAP or CHAP-MD5 or Microsoft CHAP variants). Standard RJ45 connection; supports general internet protocols: FTP, TCP/IP, UDP DNS, SMTP, POP3, MIME, HTTP, and Telnet; LAN internet protocols: ARP, ICMP and DHCP; 10 sockets (2 server sockets), AT+I application-level commands, SerialNET transparent session. Internet Security: SSL modem: Bell 103/212a, CCITT V.21/V.22/V.22bis, 300/1200/2400 bps, synchronous and asynchronous. Application selects between asynchronous protocols (Visa 1, Visa 2, and others) and synchronous protocols (including ISO 8583/SDLC). 3DES encryption; DUKPT and Master/Session key management; PED certified; VeriShield file authentication. 5% to 90% relative humidity, non-condensing. 100 - 240 VAC, 50/60 Hz, DC input 22 - 26 VDC, 1.5 Amp.